From www.ci.reynoldsburg.oh.us/siteguide.html, the flag of Reynoldsburg is a white field with the seal filling the height. Browsing on the city website, I encountered information about the city seal: "The proposed seal labelled Exhibit A and attached to Original Ordinance 63-81 is hereby adopted as the official seal of the City. (Ord. 63-81. Passed 7-13-81.)" - and that's all! 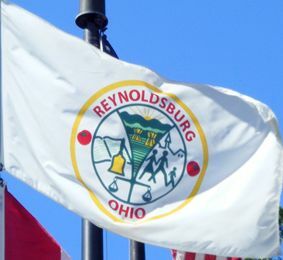 Reynoldsburg is on the eastern edge of the Columbus metropolitan area, central Ohio. The seal seems to contain a red bell, scales of justice, three stick figures, but I am not sure what the flaring green trumpet is with the red sunrise behind it. Around it the words Reynoldsburg and Ohio are separated by tomatoes. I don't think I've ever seen a tomato on a flag before!